Well, no, they saved his skull. Or just a picture of it. And it’s up for sale on Ebay! But as always, how do you know if what you’re buying (on the Internet from a complete stranger who may, in fact, be a dog) when buying a prized historical artifact? Well (as always) you should check the seller’s rating and comments. And, if possible, you should compare the item against known authentic items (or at least pictures thereof). 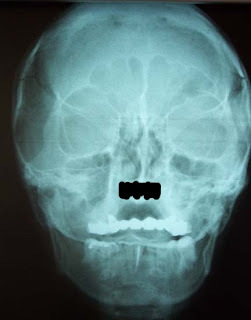 So, for your edification, I have here an authentic X-ray of Hitler’s skull for you to compare against.